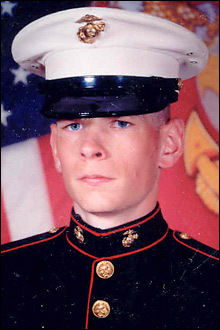 Lance Corporal Eric W. Herzberg, 20, of Severna Park, Maryland, died October 21, 2006, while conducting combat operations in Al Anbar province, Iraq. He was assigned to 3rd Battalion, 2nd Marine Regiment, 2nd Marine Division, II Marine Expeditionary Force, Camp Lejeune, North Carolina. For further information about this release the media can contact the 2nd Marine Division public affairs office at (910) 451-9033. 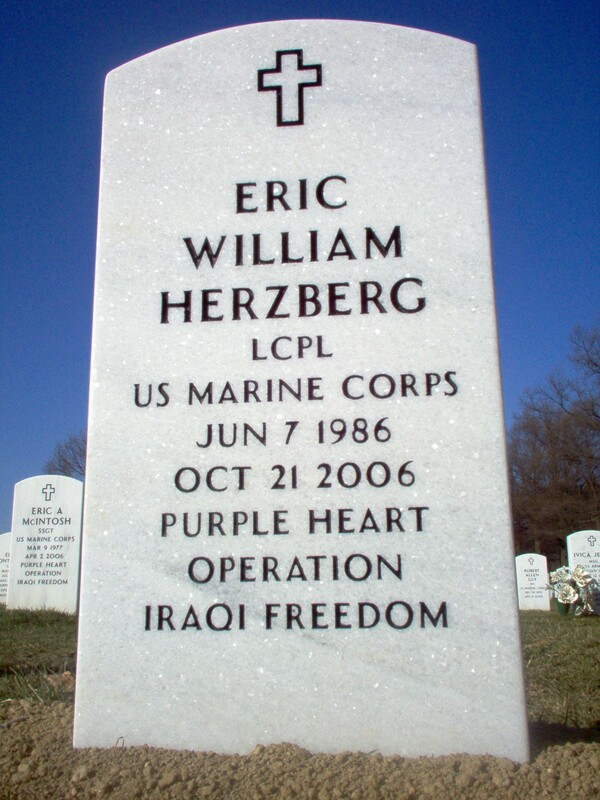 Marine Corps Lance Corporal Eric W. Herzberg, a 2005 graduate of Severna Park High School, was killed in action in Al Anbar Province, Iraq, on Saturday, the second war casualty from the community in the past two months. An athlete, a fan of Irish and patriotic country music, a wicked video gamer and rugby player, he was said to love his country and his Catholic faith. He was 20 years old. Corporal Herzberg's body has already returned to Dover Air Force Base. Following services at St. Bernadette's Church in Severn, he'll be buried in Arlington National Cemetery. His mother, Gina Barnhurst, along with his older sister Katie and younger brother Matthew, have been visited by relatives and a steady stream of friends bearing condolences at their home in Severna Park. 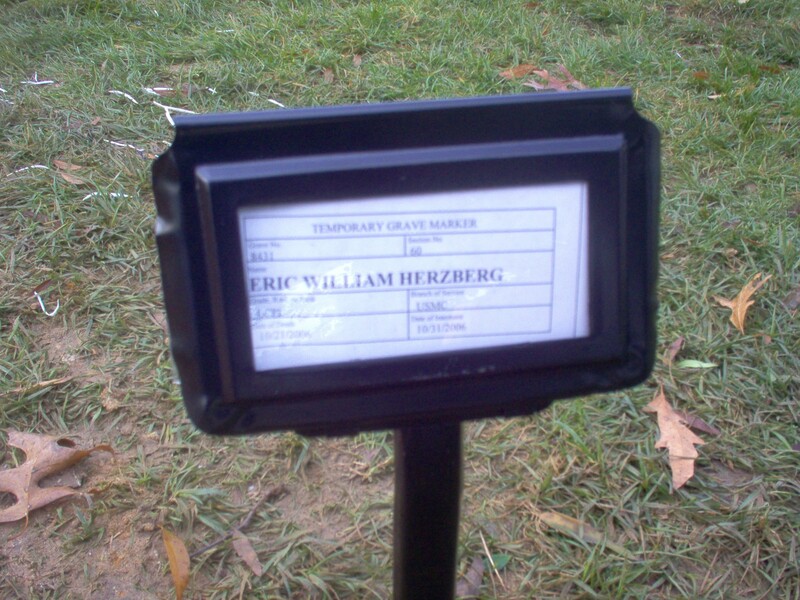 His father, Eric F. Herzberg, lives in Laurel. "We are a very private family," Ms. Barnhurst's sister, and the fallen Marine's aunt, Bernadette Martin said. But reading from a prepared statement, she said: "We are deeply saddened by our loss of our wonderful Eric, yet we are so incredibly proud of him. He was proud to be a Marine and to serve his country which he loved dearly. "He was a happy, quiet young man, with a deep compassion for others and a deep faith in God. While we grieve our loss we celebrate his life and the joy and laughter he brought into our lives." Her voice cracked as she continued. "We are so proud of him ... but so sad." Corporal Herzberg joined the Marine Corps after graduation. After leaving boot camp last October, he was deployed to Iraq on July 14, 2006. The official U.S. Department of Defense statement said he was killed Oct. 21 "while conducting combat operations in Al Anbar province." A Web site tracking casualties noted that he was a victim of "hostile fire." Corporal Herzberg is believed to be the sixth soldier with local ties to die in the line of duty in Iraq or Afghanistan in the past three years, and the 91st American soldier killed in Iraq this month. The next-highest number of fatalities was recorded a year ago this month, also the Islamic holy month of Ramadan. A total of 158 Marines in the division have died in Iraq since March 29, 2005, according to the most recent data available from the Marine Corps. Since the start of the war, 2,801 U.S. service members have died in Iraq, according to an Associated Press count. Last month, Army Private Eric Kavanagh, also from Severna Park, was killed by a roadside bomb in Baghdad. He had attended Folger McKinsey Elementary, Severna Park Middle School and Chesapeake High School. Born and raised in Olympia, Washington, Corporal Herzberg had lived in South Carolina, Nova Scotia and Ontario, before coming to Severna Park in 2000. He wrestled one year at Severna Park High School and worked at Big Vanilla Fitness Club in Arnold. His wrestling coach, Paul Joyce, who now mentors Cpl. Herzberg's brother, Matt, remembers the slain Marine's manners and even keel from working with him on the junior varsity wrestling and football squads. "He was a coach's dream," Mr. Joyce said. "I never had to yell at him for lack of effort. He might not have been one of the better players, but it was not from lack of effort." The coach said Corporal Herzberg was a great kid, "never absent, never cursing, never being in trouble." And the young man's manners were impeccable, he said, not just when in front of adults: "He was that kind of kid 365 days a year, perfectly mannered and did whatever you needed." For that he credited the young man's mother. "She did a great job," the coach said, explaining that he had both brothers in the same class. "I don't ever remember a bad word or attitude out of them, ever." Coach Joyce said Corporal Herzberg was determined to become a Marine, recalling how he asked students in their senior year what they planned to do. "He looked me right in the eye and said, 'I am going to be a Marine.' "
News reports said his mother tried to talk him out of it. "Gina was anxious to talk him out of it," his uncle, Doug Barnhurst, told The Washington Post. "She was worried about it. She was worried that he didn't know what he was getting into. But he convinced her it was a calling." His Roman Catholic faith guided his decision to join the Marines and helped him convince his mother of the surety of his vocation, said his maternal grandfather, William Barnhurst. "Mom, I'm so happy," he told his mother by phone from boot camp at Paris Island, South Carolina, his uncle said. "This is what I want to do." Gary Bulkley's son, Matt, was one of Corporal Herzberg's best friends. "There was a group of them, maybe 10 or 12, who were always over here," Mr. Bulkley said. "They set up four or five TVs and every Friday and Saturday during the year, and all summer, they were here. Eric was one of those terrific kids. That group was really close." Mr. Bulkley said he, too, tried to talk the young man out of joining the Marines right out of school. "I said maybe he should wait, at least see if your enthusiasm is consistent," he said. "But he wanted to be a Marine in the worst way. "When my son called to tell me, it was heart-wrenching. I was so sad." Matt Bulkley, reached at his Longwood University dorm last night, said the group was really close. "We were brothers," he said. "We saw each other every day. We were like family - we were all there for each other." He added that all his friends know people who are going into the military, but "we never thought it would be him. We could not picture this happening to him." Another of his band of "brothers," Chris Larkin, who attends Anne Arundel Community College and will transfer to UMBC next year, said simply, "He was just the best friend a guy could have." Now that close-knit group of friends is coming home from colleges across the country for services this weekend. "Every one of us is coming home to be there for him and his family," Matt Bulkley said. "Please join us as we pray for all of the brave men and women still serving our country in harm's way, and for their families. "And join us as we pray for the peace which will let them all come home." Courtesy of Laura Ingraham & Eric W. Herzberg, Sr. I took time out from politics today to attend the funeral of Eric Herzberg, Jr., of Severna Park, Maryland. Herzberg, 20, a proud Marine, was killed in Iraq 10 days ago. He was buried at Arlington National Cemetery. It was a glorious fall day, perhaps the last warm day of the season. It was a privilege to be present as this young Marine was laid to rest. I asked his grandfather how long Eric had wanted to be a Marine. "Ten, fifteen years--since he was a little boy," he said. 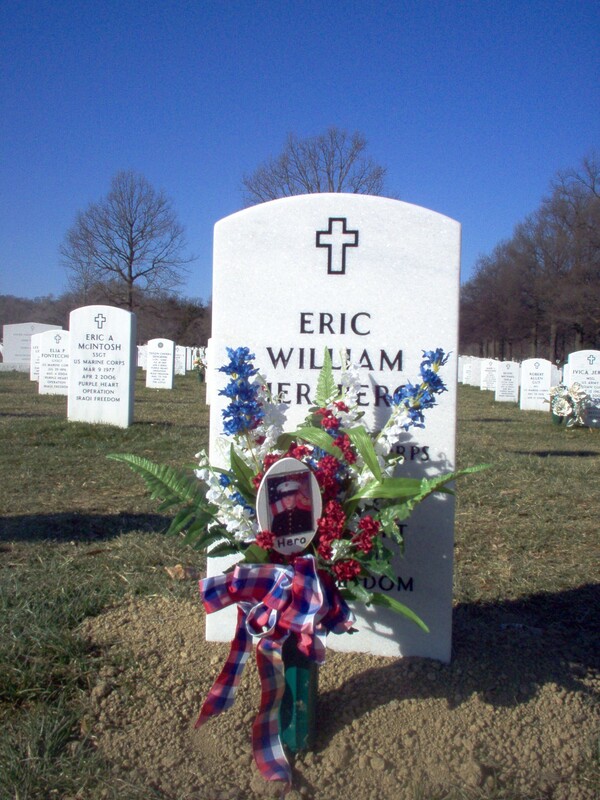 One of Eric's high school friends, riding on the bus to the gravesite remarked, "Man, that boy loved this country and died doing what he believed was right." Others, clutching their Kleenex, nodded. As we think about our country's future and the challenges ahead, I think of people like Eric. Most of our fallen heroes may not have gone to Harvard or Yale, but I would bet that they had a greater sense of professionalism and dedication to principle than most politicians in Washington. 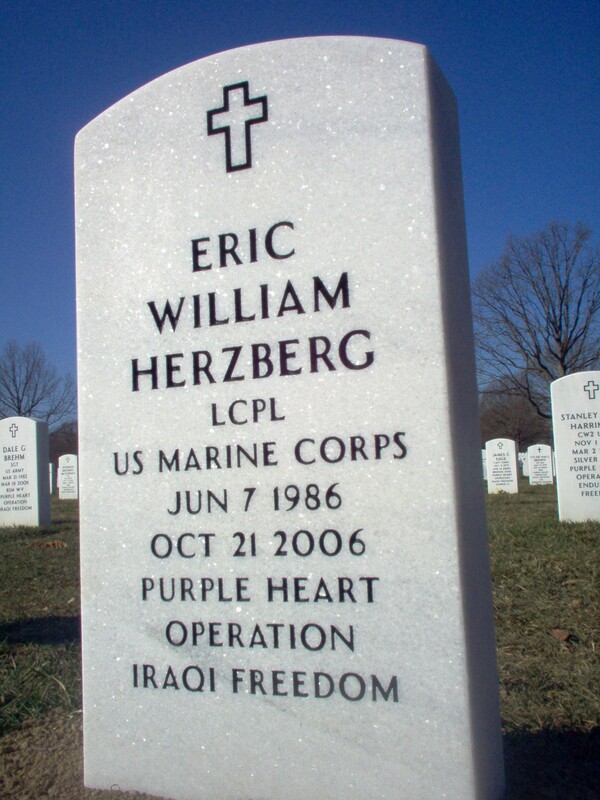 "I'm Eric Herzberg, Lance Corporal Eric Herzberg's father. Thank you all for coming here to honor Eric, especially those of you who traveled great distances. We are humbled by the show of support and love for our son. I would especially like to thank Kevin Kavanagh for being here today. Kevin's son, also named Eric, also 20 years old and also from Severna Park, was also killed in Iraq last month. Kevin has been a tremendous source of support this week. A keen sense of ethical conduct: INTEGRITY. Describing one whose word, once given, is a guarantee of performance. It's not because you are in pain. We know that now you are at peace now. It's not because you were unprotected and alone when you died. Not only were you with your friends, your brothers, but you had legions from across America praying for you. We cry for you not because you were unprepared. You had the best training in the world, the best equipment, and the best leadership. And you prepared yourself by deepening your relationship with the Lord who made you. I believe you knew how temporary this world is and you prepared yourself for the next world by reading His word every night. And we certainly don't cry because we think of you as a victim. The victims right at this moment are us--your friends and family, particularly your mother Gina, your sister Katie and your brother and best friend Matthew. We feel almost immobilized with grief right now - but we know you would not want us to remain in this state too long. We know that you want us to continue to serve others as you did. No, we don't cry for you because of those things. We cry for you because of the huge sense of loss we feel, which is also felt by our community of family and friends. And we grieve because of all those whose lives you now won't touch here on earth. Eric, we all needed your presence here. Today we feel that sense of loss for what you won't accomplish on this earth. Yet still, through all this, we remember the Marine with compassion who turned thoughts of hate and division into love, affection and unity--one Iraqi at a time. We remember the son who always spoke the truth, and can help heal wounds--even those within his own family. We remember the friend who is always loyal and faithful. And the spiritual warrior who never shied away from necessary battles but always brought his faith and humanity with him. Eric, we cry because we know you would have been a dad who would have raised kids just like you. Yes, we came here to honor you, Eric, but we had it all backwards. It is you who have honored us. We feel honored just to have known you as long as we did, and to have seen the example of your life. You were tested under the most trying of circumstances and your character and integrity never went unnoticed. I know you are wearing it well son. Goodbye for now. We love you." There is nothing I can add to the words of a grieving father, except to say that we owe it to these young men and women and their families to accept nothing less than victory against the dark, evil forces that rejoice every time a young Marine is killed. The family and friends of Lance Corporal Eric W. Herzberg gathered to say goodbye to him yesterday in a long, languid caravan that wound through Arlington National Cemetery, their sedans, minivans and motorcycles led by a black hearse carrying the body of the 20-year-old Marine. 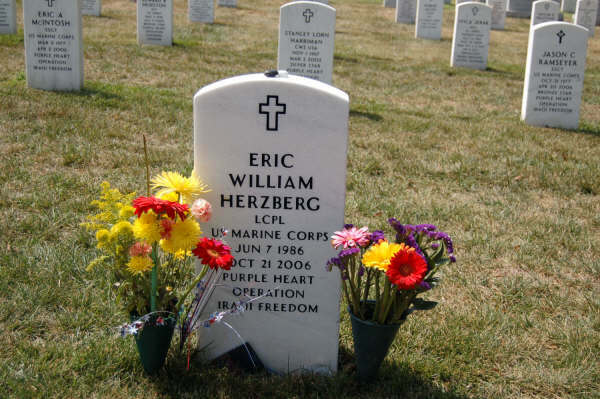 Herzberg, of Severna Park, was killed in Iraq's Anbar province October 21, 2006, three months after his arrival. 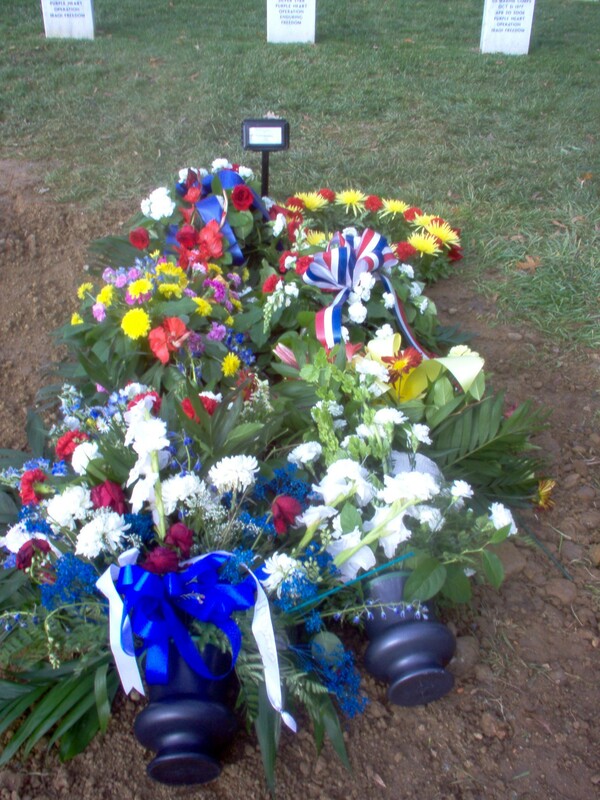 He was the 270th person killed supporting Operation Iraqi Freedom to be buried at Arlington. He was assigned to the 3rd Battalion, 2nd Marine Division, II Marine Expeditionary Force, based at Camp Lejeune, North Carolina. Herzberg's mother, Gina Barnhurst, said the ceremony to honor her son was "beautiful," a hero's tribute on a warm, brilliant autumn day. His older sister, Katie Herzberg, stood by his coffin and recited from an Irish blessing: "Do not stand at my grave and cry; I am not there. I did not die." After the Marine honor guard played taps and fired a three-volley salute, Barnhurst received a folded flag in honor of her son, then leaned her head against his coffin and wept. "He was just a beautiful person," Barnhurst said after the ceremony. "He was fun, he was sensitive. And the thing I hate the most is that he's not going to be a daddy. He was really great with kids." From the moment her son went overseas, Barnhurst worried about him. Herzberg called her on her cellphone to reassure her whenever possible. But a few weeks before his death, the calls stopped coming, replaced by the occasional hurried e-mail to relay his safety. Though her son did not say so, Barnhurst could sense he was working in increasingly dangerous places. "It was bad. I know it was bad. They were going through hell," she said. Before Herzberg could call again, Barnhurst said, he was shot through the neck while on patrol. Family members said Herzberg was a deeply spiritual person and a fervent patriot who was recruited to join the military in high school. After graduating from Severna Park High School in June 2005, he went through boot camp at Paris Island, South Carolina. He graduated October 28, 2005, almost exactly one year ago. Herzberg returned home and helped with local recruitment efforts before continuing his training in the Mojave Desert. He came home from that experience brimming with confidence, his aunt Bernadette Martin said. "When he came back from infantry training, he was tan, his muscles were big and he had a new Celtic symbol tattoo," said Martin, who also lives in Severna Park. "He was in charge of his world, and he was so proud of himself. "We'll just miss him so much," she said. "It was so hard to go there today and say goodbye to him. He gave everything to our country; he loved his country. He was so proud to be a Marine, so he deserved the honor he got today." Martin said that her nephew's death transcended political tensions about the war. "Regardless of your politics, everyone can pray for peace," she said. Herzberg's mother also said she wanted her son to be remembered as "a peacekeeper." When she attends Mass at St. Bernadette Parish in Severna Park, she always whispers something to herself, something Eric liked to say: "Go forth in peace, love deeply, laugh often and live." This band of brothers did not wear the uniform of their fallen comrade. They wore dark suits like the other mourners who packed into St. Bernadette Catholic Church in Severn, Maryland, yesterday to say goodbye to Lance Corporal Eric W. Herzberg. Bonded by tribulations and joys of high school life, forged in adolescent doubt and bravado, they came together from colleges and jobs across the country. They stood together at the altar to make their peace as a team. Today they gathered again to lay him to rest among the rows of marble monuments to the nation’s fallen at Arlington National Cemetery. “Eric was more than a friend, he was a brother,” they said. He was one who stood by his friends, teammates, family and faith with the same sense of duty that moved him to become a Marine right after graduating from Severna Park High School in 2005. Corporal Herzberg, a squad machine gunner, was killed in action October 21, 2006, in Iraq’s insurgent-infested Al Anbar Province, from which so many reports bearing the worst news have been coming. After the Mass — attended by a few hundred friends, relatives and fellow Marines in dress blues — the band of brothers stood again for the media gaggle of television cameras and microphones thrust at their young, clean-shaven faces. And again they spoke as one. Their friend was undoubtedly proud of them, as they are of him. A few are following his example by joining the service — one at the Naval Academy, another in boot camp at Camp Lejeune, N.C., where Corporal Herzberg was forged into a Marine last fall before being dispatched to Iraq in July. They bore their brother, draped in Old Glory, past a phalanx of crisply saluting Marines and into the sanctuary Corporal Herzberg and his family called home. The throng stood to sing “All Are Welcome Here,” with the refrain “let us put an end to fear and danger,” as his coffin was brought before the altar. The Mass was filled with music, hymns and featured voices. Friends stood to read scripture — lessons, mostly. His pastor, Father Domenic Cieri, reflected on the young man he knew as a reverent servant of his God. That love of country made him want to serve after September 11. He resolved to become a Marine. Father Cieri said, however, that his gung-ho approach gave way, as it did for many in the country, to doubts about the war in Iraq. But his sense of duty never wavered. The pastor wasn’t sure he should share the story with those attending the fallen Marine’s funeral service, but he said the young man’s mother encouraged him to do so. He said he no longer believed in the war in Iraq, and he wanted to know what to do. The 20-year-old’s pastor said he was flustered. “I thought, you know exactly what to do, what you’re going to do,” Father Cieri said. “Then I told him, ‘Eric, we love you. Do your duty.’ ” He did. Corporal Herzberg’s grieving mother stood to give thanks to all who had come to her family in their immediate hour of need, but also to address the larger questions brought forth by grieving in all wars. “I am able to speak because Eric is holding me up, asking me to, while bathed in the arms of Jesus,” Gina Barnhurst said. Then she made a simple plea. Rep. Wayne Gilchrest, R-Kent, also a former Marine, sat quietly among the mourners and stood in the background as the crowd mulled around outside the church. He and others watched Corporal Herzberg’s band of brothers huddle together. “I come simply to show respect ... to honor him and his family for his extraordinary life and their extraordinary loss,” Mr. Gilchrest said. The Marine’s congressman struggled for words to express what he felt at this ceremony and too many others he has attended. When Ms. Barnhurst learned that her son was going into the Marines, she started a group at the church. The Peace Keepers meet every Wednesday night to pray for peace, to support one another and all those serving. “She is just an inspiration, and her son was just like her,” said Ann McDonald, a pastoral associate at the parish. After the service yesterday, mourners gathered for a meal at the Elks Club up the road. Some laughter was heard as memories were swapped in table conversation. From Eric's family, we again want to thank each of you for your kindness during these last four weeks. You are a continuing source of comfort to us. Through the tireless efforts of several amazing individuals, two memorial scholarships have been created in Eric's name. The Eric W. Herzberg Memorial Scholarship - Florida is for at risk 8th and 9th graders, and the Eric W. Herzberg Memorial Scholarship - Maryland is for graduating seniors from Severna Park high school (Eric's school). The scholarship in Florida was the inspiration of Faith Carmen, the mother of Justin Carmen. Justin is one of Eric's Marine brothers and was with him when he died. This woman is an angel. Most of you did not know Eric personally. Mainly through the creativity of Torin Kropp, Eric's cousin, we have created a web site (www.ericwherzberg.com) that provides information about Eric, many moving tributes to him and his life, information about the scholarships, and provides an opportunity to donate online. Through partnership with the Hillsborough Educational Foundation of Florida, donations made to the Eric W. Herzberg Memorial Scholarship - Florida, will be matched dollar for dollar. We are continuing to work on partnering with a non-profit Educational Foundation for Eric's Maryland scholarship. Part of the criteria for each scholarship is for the applicant to write an essay which includes information about Eric's character and their thoughts and plans about serving others. The web site will be a useful source of reference material for scholarship applicants. Again, we cannot say thank you enough for what you have done collectively. We wil never forget it. We can think of no more fitting way to honor Eric than to try and use the pain of his loss to help others. My name is Bernadette Martin, Eric's Aunt--his mother Gina's sister. 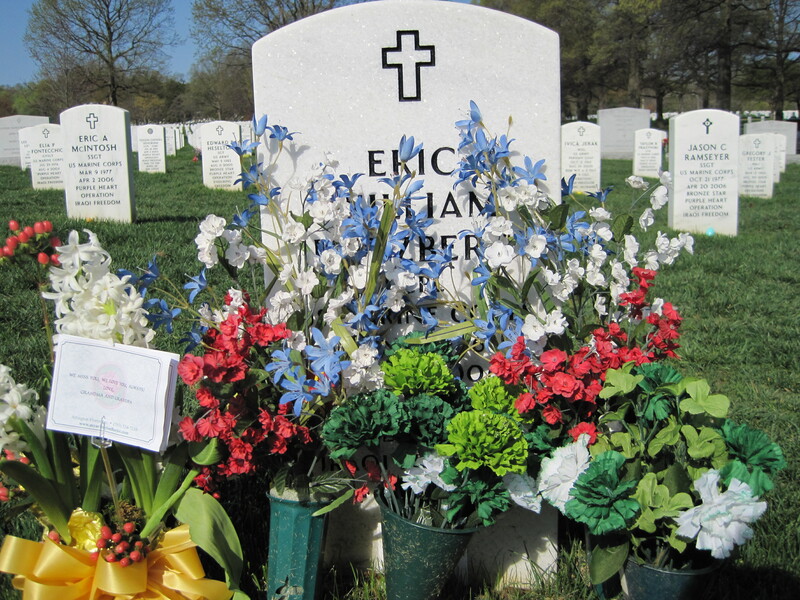 First, I have to thank you so much for everything that you do to honor Eric and the other brave men and women who are laid to rest at Arlington. What you do means so much to our family--thank you! I have been in touch with Holly, and she has told me about your efforts to make the web pages unique to the individuals. I am attaching two items that were very moving to our family and guests that we would like added to Eric's page. at graveside services at Arlington National Cemetery.